I have Grace Hopper and eos Tangerine Lip Balm to thank for introducing me to Avanade. Without computer science pioneer Grace Hopper (1906-1992), there would be no Grace Hopper Celebration of Women in Computing (GHC). Named in honor of a trailblazer in the early days of modern computing who serves as a role model for women in what remains a male-dominated field, GHC is the largest annual gathering of women technologists in the world. Last year, more than 12,000 attendees from 63 countries and over 1,300 tech companies attended the event. Without GHC, I would likely not have discovered Avanade. As a graduate student finishing my masters in computer science at the College of William and Mary, I arrived at last October's 3-day GHC in Houston with a stack of resumes and hope of finding a great summer 2016 internship. In my case, that meant an opportunity to carry forward my passion for wearable technology. Out of necessity, because of the event's scale, I had done my pre-event homework to create a hotlist of companies I considered my top prospects and identified their booth locations. Since Avanade's core business isn't wearables, Avanade wasn't on my list. That's where the eos Tangerine Lip Balm came in. It was the last day of the conference. I'd visited the companies on my list and had a little time to spare. A friend had given me the lowdown on company booths with the best swag. Avanade was passing out eos Tangerine Lip Balm. 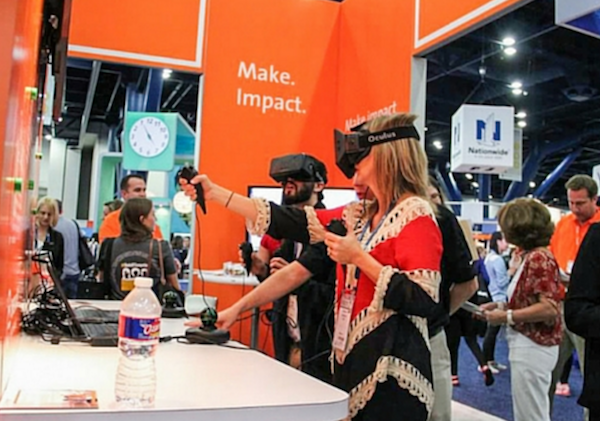 I was in swag collection mode at that point, so to be honest, I would probably have snagged my eos and been on my way if Mick Slattery, Avanade North America's President and one of several of their executives hanging out in the booth, hadn't approached me. He asked about my interests. I shared my passion for wearables. He filled me in on some cool Avanade projects that are right up my alley. I handed him my resume and accepted his breakfast invitation for the next morning to learn more, beyond impressed by the level of interest and involvement from Avanade's leadership in the conference and future interns. The rest, you might say, is history! I arrived in Seattle in June for my internship at Avanade. Working on wearable technology for Williams Martini Racing F1 pit crews has been a great fit. It's an exciting opportunity I am very grateful I found - thanks to that eos Tangerine Lip Balm.